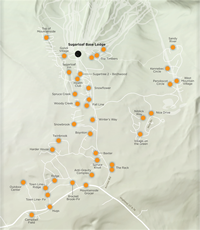 The Sugarloaf Explorer bus system was established during the 2007-2008 ski season in response to the expanding needs of the Sugarloaf ski area to more efficiently transport on-mountain skiers. The service provides car-free transportation on a network of routes, linking neighborhoods on the mountain in the Carrabassett Valley with the Sugarloaf Base Lodge. 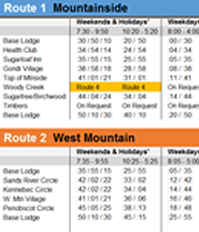 Evening service allows access to the many amenities available on-mountain with evening service off-mountain to Carrabassett Valley on Friday and Saturday. All service is free of charge to passengers. The Sugarloaf Express daily bus service from Farmington to Sugarloaf returns beginning Saturday, December 1 and runs until a date to-be-determined in mid-April, dependent on late-season snow conditions. The NEW Sugarloaf Express daily bus service from Stratton to Sugarloaf begins Monday, December 17 and also runs until a date to-be-determined in mid-April, dependent on late-season snow conditions. Download schedule and fare information. Sugarloaf Explorer is operated by Western Maine Transportation Services, A Regional Transportation Corporation serviing western Maine since 1976. Sugarloaf Explorer bus service is supported by Maine DOT, USDOT, the town of Carrabassett Valley, home owners, condominium associations, Sugarloaf Resort and local businesses. Because of special activities pertaining to New Years Celebrations the Sugarloaf Explorer service will extend operations until 2:00 am. You will need Adobe Acrobat Reader to view the documents, get Adobe Reader . Oxygen tanks and concentrators must be safely secured to users or their wheelchairs. Most Sugarloaf Explorer vehicles are lift-equipped and can carry up to 2 riders in wheelchairs. Only trained service animals under control of the rider, or small pets in carriers are permitted. If you have a suggestion or complaint about any WMTS service, please call 1-800-393-9335 selection 7. Leave a detailed message and your phone number. The staff will investigate and contact you within one business week.